Last night Frances Liardet from Bath Sands (stillbirth and neonatal death charity) talked to the Bath WI. We learned such a lot about just how many people have gone through and continue to go through the tragedy of a stillbirth or neonatal death of a child, about how important it is both to pay attention to changes in foetal movements and to quickly contact your hospital or midwife – but also that a mother paying attention to changes is certainly not the only factor; we need more midwives, more frequent checkups and sometimes there is an unpredictable congenital cause that nobody could foresee. If you or someone you care about has gone through the loss of a baby, Bath Sands (part of the national Sands charity) offers the chance to talk to someone. Sands ‘befrienders’ are not counselors but understand from their own experiences what parents are going through. Bath Sands meet the first Tuesday of every month at St Stephens Church, Landsdown Road, Bath, BA1 5SX between 7 and 9 pm and you can contact them via their website or email support@bathsands.org.uk. If you would like to help Bath Sands​ you can donate through JustGiving (details on the fundraising page of the website). 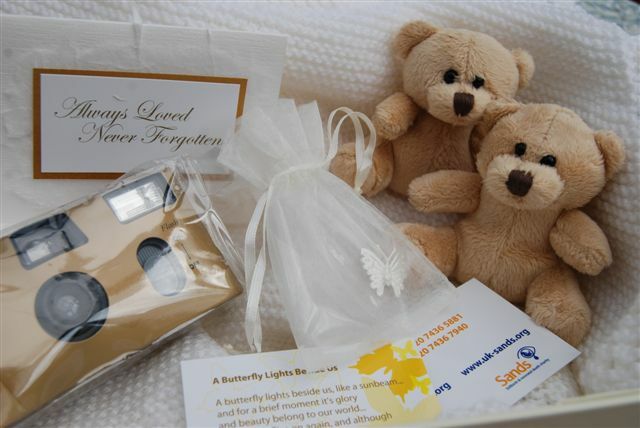 Bath Sands also provides the RUH with memory boxes for grieving parents. Memory boxes are a place to keep mementos of a lost child – photographs, perhaps a lock of hair, a hand print or footprint. More than that, memory boxes become a place to grieve, to remember and reflect and, in time, to draw comfort. The boxes themselves are beautiful, containing a hand-knitted blanket, two teddy bears – one to keep & one to place with the baby – a candle, a memory book for photographs and mementos, a keepsake box, cards and poems. There is also a complete pack of information leaflets from Sands. These boxes cost approximately £25 each to put together and you can buy a box to donate and help ease an unimaginable time. If you are a knitter, you can make blankets for memory boxes. Patterns are on the Bath Sands website (or you can download the ones below). Please note the address on the patterns has not been updated and completed blankets should be posted to: Frances Liardet, Marston Mill, Jeffries Lane, Frome BA11 2NZ. If Bath Sands has more blankets than they need in our area, they will pass them on to other regions.